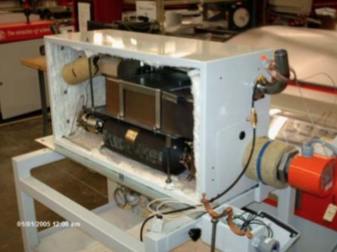 With increased focus on green technology, a global chemical company required a solution for the condensate vapor produced by their thermal flexographic printing plate processor. Since the unit was already in the field, a retrofit unit needed to be designed for new and existing models. Given that PEKO currently produces this unit, the customer worked with PEKO to create a cost effective, green system to be incorporated into all versions of the plate processor. The final design was a catalytic oxidizer (CATOX) that preheats and burns the condensate, emitting only CO2. This design eliminated customer, technician and environmental contact with the condensate. PEKO builds and assembles all CATOX kits to retrofit the system into the customer’s existing field units. After being thoroughly analyzed in a custom test fixture created by PEKO, CATOX systems are shipped directly from PEKO to end user. PEKO provides training for the customer’s technicians in-house to install the system and ensure quality work is done on site. PEKO’s experience with the customer and knowledge of the product enabled a true retrofit to be designed and manufactured. Product and environmental safety were increased by eliminating exposure. The design was an incredible success, with excellent functionality and provided a huge cost savings to the customer in lieu of a complete design overhaul.